If you thought that shooting sports were declining…. To some firearms owners, it was not so long ago that the entire Canadian outdoors industry took a huge nosedive due to the excessively complex and senseless paperwork and process brought in by the passing of Bill C-68. Canada’s huge industry & heritage based on firearms, hunting and outfitting basically decreased by over 50% in the following few years. With a whole generation of Canadians who had been brought up with the birth of cell phones and computers, many feared that the firearms community of Canada was slowly declining as more and more places folded shop and locked up their stores for good. I’m proud to say that it seems that despite the best efforts of the anti-firearms fanatics who decry all guns as evil and those who would rather legislate against legal firearm ownership, that the signs are showing that both firearms ownership and retail are increasing after a decade of decline. It appears that greater numbers of younger people are becoming involved in shooting sports, and that the older enthusiasts are becoming less and less bitter at the unfair and unjust firearms regulations. Just in the last two years, two new stores have opened in southwest Ontario; one from a specialist in firearms auctions and another to continue the legacy and grand tradition started by Keith Lovett over 50 years ago. Many people who have been in the firearms industry in Canada for any length of time have at least heard mention of Keith Lovett and his continuous devotion to firearms ownership. Now however, Keith has allowed several others to continue in the retail of firearms and accessories. Richard Irvine, Jim Salisbury and Phil O’Dell; to name a few of these devoted individuals, believe that the industry is not decreasing, but is growing and thriving. 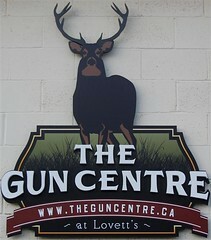 The newly christened store, “The Gun Centre” has reopened at the former Lovett’s location in Kitchener and according to the new management and staff, has been well received and has been given many favorable reviews. Sales, service and smiles abounded at the grand opening of The Gun Center just a short time ago, and if you talk to anyone who works there, they will tell you that they are seeing many new faces in addition to regulars from when it was managed by Lovett himself. I for one am glad to know, despite the anti-firearms rhetoric and actions performed by Ontario’s current politicians, that our recreation, our sport and our heritage is continuing to grow. We need to continue to support the efforts of all people, groups, and businesses are the key to our continued growth.